Under a cloudless night sky, a second-generation Russian cosmonaut, a Japanese physician-astronaut and a NASA shuttle veteran blasted off aboard an upgraded Soyuz spacecraft Tuesday and set off after the International Space Station on a mission to boost the lab's crew back to six and clear the way for a final shuttle resupply mission next month. Shuttle-veteran Fossum, Soyuz TMA-02M commander Sergei Volkov and flight engineer Satoshi Furukawa, a space rookie, lifted off from the Baikonur Cosmodrome in Kazakhstan at 4:12:45 p.m. EDT (GMT-4; 2:12:45 a.m. Wednesday local time) and streaked away through a clear night sky. Live television views from inside the central compartment showed Volkov in the center seat, flanked by Furukawa on his left and Fossum on his right. 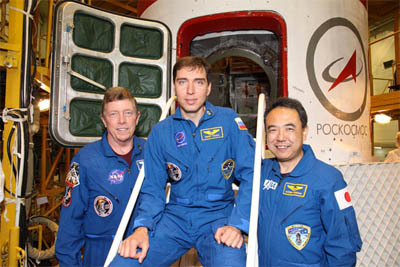 All three appeared relaxed and in good spirits as they monitored cockpit displays during the climb to space. "We feel great and everything is fine on board," Volkov radioed. It is the second Soyuz flight for Volkov, who spent 199 days in space in 2008 and served as commander of the International Space Station's 17th expedition, while Fossum, a veteran of two shuttle missions in 2006 and 2008, is making his first trip aboard a Russian spacecraft. There were no problems during the eight-minute 45-second climb to space and moments after reaching orbit, the Soyuz TMA-02M spacecraft's solar wings and radio masts deployed as planned. This was the second launch of an upgraded Soyuz with an improved digital avionics system and flight computer that is more capable, yet lighter, than the preceding model. With the Expedition 28 crew back up to six, the astronauts and cosmonauts will face a busy month of work preparing for the arrival of the shuttle Atlantis two days after launch July 8. Atlantis' mission is the final flight of a space shuttle and NASA has loaded it up with enough supplies to support the station crew through 2012.